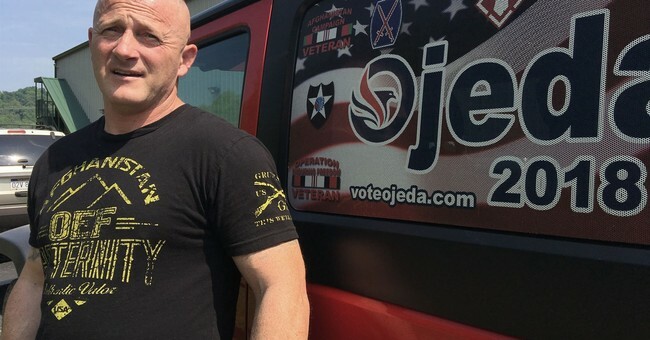 After failing to win the West Virginia House in the 2018 midterms, Richard Ojeda, a former Army paratrooper, announced he is running for the Democratic nomination to go up against President Donald Trump in 2020. In his first ad for president, Ojeda describes how he is going to fight for people in Washington, D.C. and what he saw during his service overseas. “I never dreamed that I would come home only to find children in my own backyard that have it worse than the kids I saw in Afghanistan,” he narrates in his presidential ad. The video and the narration is eerily similar to Ojeda’s ad when he was running for Congress. “I never dreamed that I would come home only to find children in my own backyard that have it worse than the kids I saw in Afghanistan,” Ojeda states in his Congressional ad. In way, it’s fiscally responsible to reuse material and just change the narration, rather than paying for a whole-new ad. Anyone who is elected to Federal public office, or is appointed to the Cabinet, must sacrifice any net worth over a million dollars to charity of their choice (a real charity, not some family foundation run by their kids). After they retire from public office, they will collect a $130,000 pension per year. They can make another $120,000, on their own, for a total of $250,000 per year maximum for life, subject to automatic yearly cost of living adjustments. If you really want to sell your country out to big pharma, all you can get in return for your soul is $120,000. Elected officials will have the same healthcare package options as everyday Americans. CNN reports Ojeda had voted for then-candidate Trump for president in 2016, but has since grown to dislike him. He frequently called Trump “a total whacko” during the midterms.